A&S Play Zone’s Bounce House Rentals are one of the best birthday party ideas in Cincinnati & Dayton. Our bouncers are the best entertainment for kids and adults. A&S Play Zone in Cincinnati, Ohio can turn any party into a memorable event with our wide collection of bounce house rentals and inflatable bouncer rentals. Not only do these bounce houses work well for kid’s birthday parties, but our top of the line inflatable rentals will make any company picnic, graduation party, festival, fundraiser or special event a memorable experience. Our bounce house rentals in Dayton come in many different shapes and sizes. We have princess castles to dinosaurs. 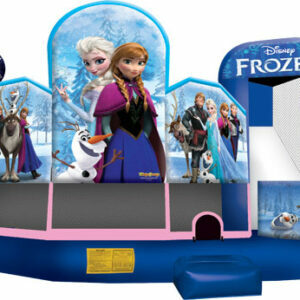 We have frozen bounce house rentals and Mickey mouse bounce house rentals. We take pride in assuring that each rental is quality tested, cleaned and disinfected after every event. This is a very important factor to consider when you are renting party equipment. You can stop by our facility and see for yourself. We have the cleanest bounce house rentals around. If you are looking for bounce house rentals near me, look no further. We deliver our bouncers to your home, set them up and take them down. A&S Play Zone will use our professional expertise to set up your party’s bounce house rental to ensure 100% safety for your event. In the State of Ohio you are required to be licensed and insured if you rent bounce houses. 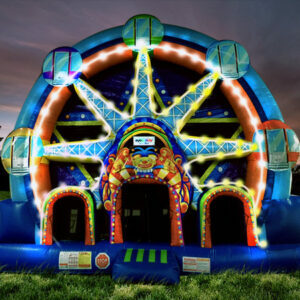 A & S Play Zone licenses all of their bounce houses with the Amusement Ride and Safety Division. We also guarantee that you will completely satisfied with your rental. Your happiness is our top priority! If you are planning an event in the Cincinnati or Dayton area of Ohio, give A&S Play Zone a call. You may even stop by our 40,000 square foot warehouse and showroom. We promise to help make your event a one-of-a-kind experience for all your guests! If you are wondering what type of bounce house to rent or what size of bouncer you will need for your event then check out our Bounce House Rental Guide for more information. Some people want to see their exact jumper rental and you can check out our YouTube channel for additional information on our inflatable houses. Finally, We offer some safety tips that should be followed when you rent a moonwalk rental. Check out our inflatable bounce house rental safety tips : When renting a bounce house you may want to rent Tents, Tables and Chairs so check out our other party rental items as well. A&S Play Zone Party Rental Items will bring out the fun in everyone at your event! Want to know what our customers think of us? Check out our reviews here. Google Reviews or Facebook Reviews.